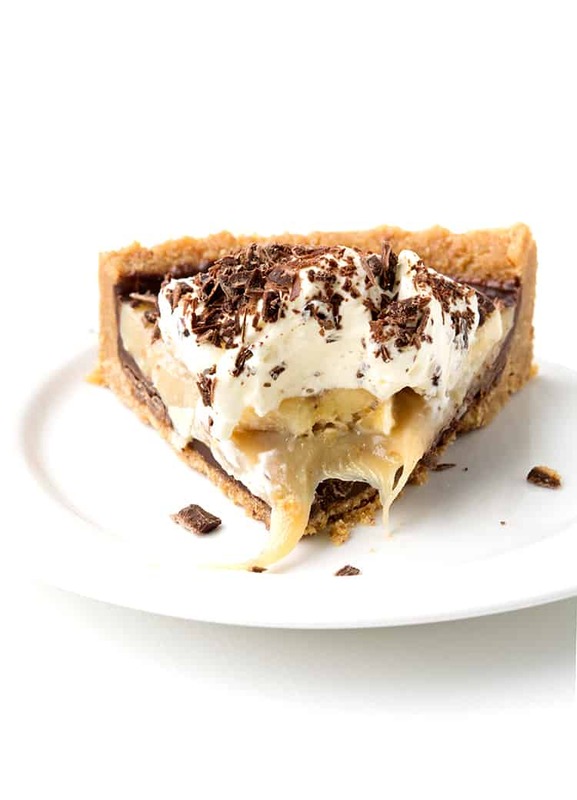 You’ll love this gorgeous No Bake Banoffee Pie. 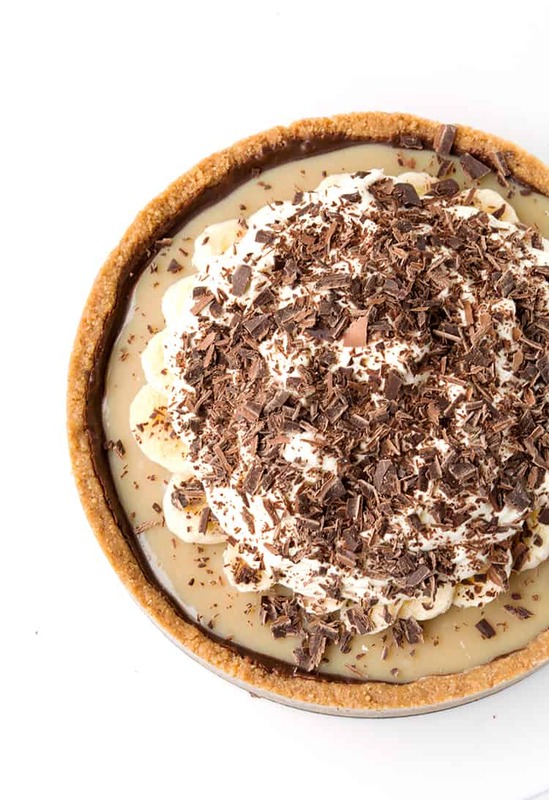 With a buttery cookie crust, brown sugar caramel, fresh bananas, whipped cream and a secret layer of chocolate, it’s the ultimate dessert. Say hello to my No Bake Banoffee Pie. 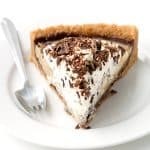 A gorgeous, no bake pie with a crumbly cookie crust, a smooth caramel filling, sliced ripe bananas and whipped cream. Of course, I couldn’t stop there. 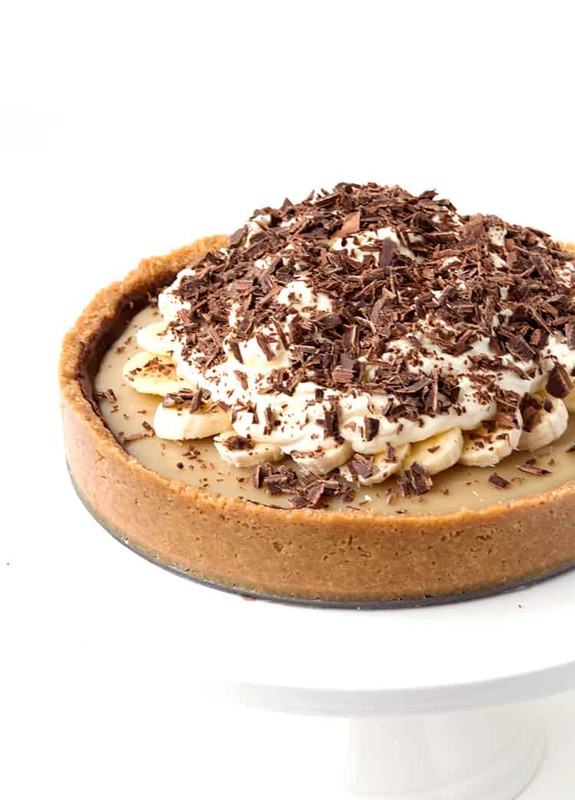 I have always loved Banoffee Pie. 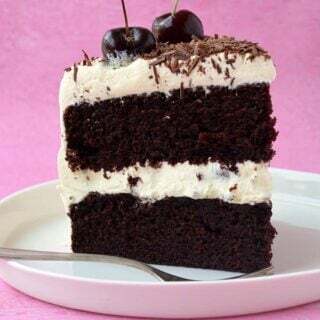 But I never thought about posting a recipe for it on Sweetest Menu, until one of my lovely readers requested the recipe on Instagram. So this one’s for you Emma! This British-inspired dessert is quite the treat, with its rich, thick caramel and mountain of luscious cream. It’s also no bake so perfect for when guests are coming over and you want to prepare dessert in advance. So let’s break it down. 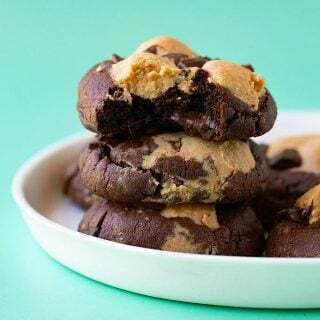 First, there’s a buttery cookie base made with Digestive biscuits or graham crackers. Any plain sweet biscuit will do. Then a layer of melted dark chocolate for a little sweet chocolate surprise. Next is a creamy 3-ingredient caramel made using condensed milk, butter and brown sugar. Pour it over the top, and then pop it into the fridge for 3-4 hours to set or even overnight. 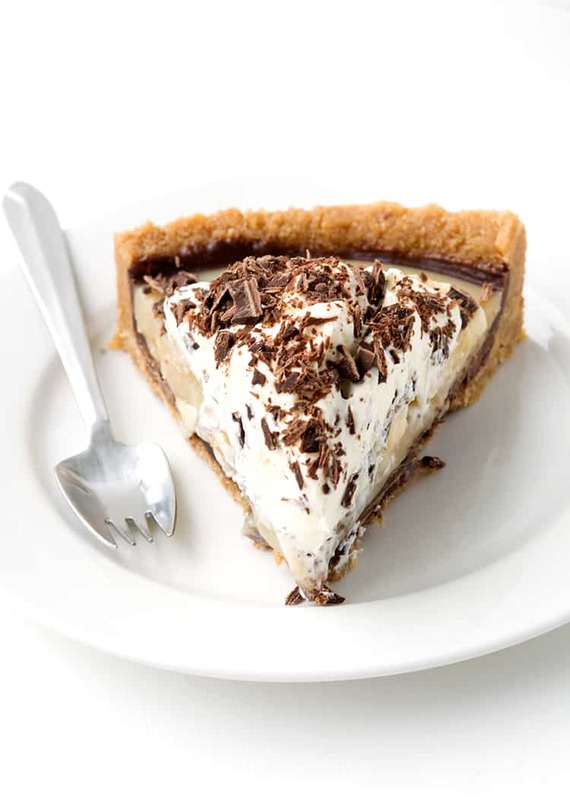 When you’re ready to serve, you can just slice up some fresh bananas and cover the pie with whipped cream. Sprinkle over some shaved dark chocolate and welcome to caramel-covered heaven! 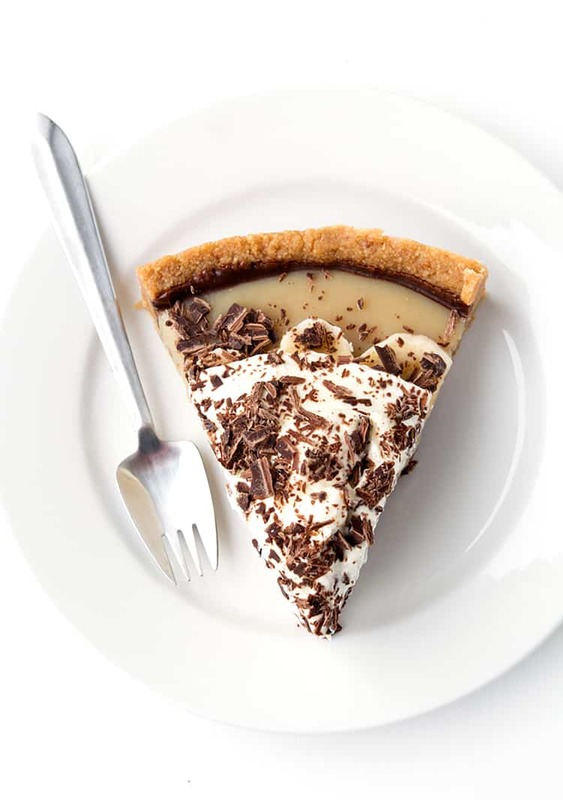 Every bite is deliciously rich and creamy, with a little crunch from the chocolate-covered cookie crust. I have to warn you, this whole banana, cream, caramel combination is hard to resist! So how are you! How was your weekend? We’ve finally settled back into the swing of things after our holiday. It almost seems like a distant memory! I’m working on some new and exciting projects for the blog at the moment, and I can’t wait to share them with you. Plus it’s almost time to unleash the holiday baking – my fave! Let me know what Christmas recipes you would like to see on SM this year! In the meantime, let’s all eat pie! 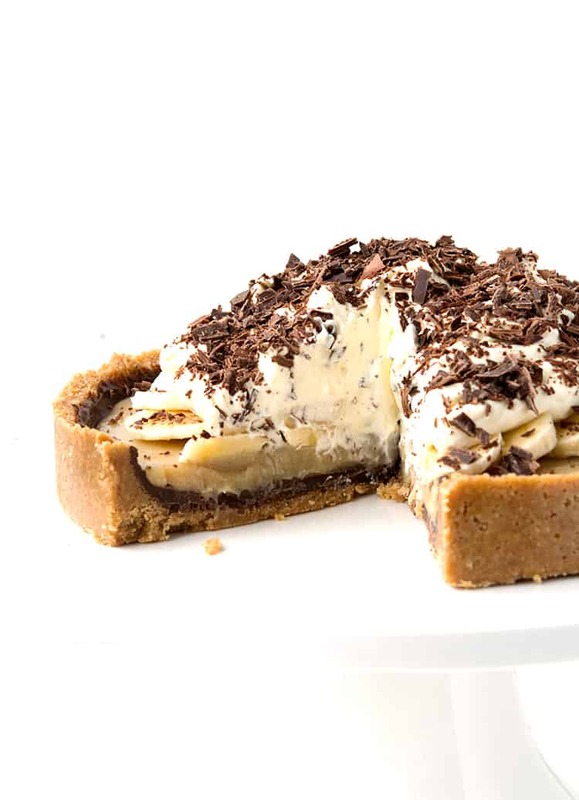 An easy no bake Banoffee Pie with a cookie crust, creamy caramel, fresh bananas and whipped cream. Lightly grease a 9 inch loose bottom pie tin or springform cake tin. Finely crush your biscuits or crackers using a food processor or put them in a sealed sandwich bag and bash them with a rolling pin. Add the melted butter and stir until the crumbs are all coated and resemble wet sand. Melt your chocolate in the microwave, stirring every 30 seconds, until smooth. Leave to cool slightly. Then pour over cookie crust, brushing right up the sides. Then pop back in the fridge. To make the caramel, place the brown sugar, butter and condensed milk in a medium saucepan and place on a low-medium heat. Stir gently until all the ingredients have combined and continue to cook for a few minutes until the caramel thickens and the sugar is completely melted. Add a pinch of salt. Set aside to cool slightly. Pour caramel over cookie crust and place in the fridge for at least 3-4 hours or overnight to set. 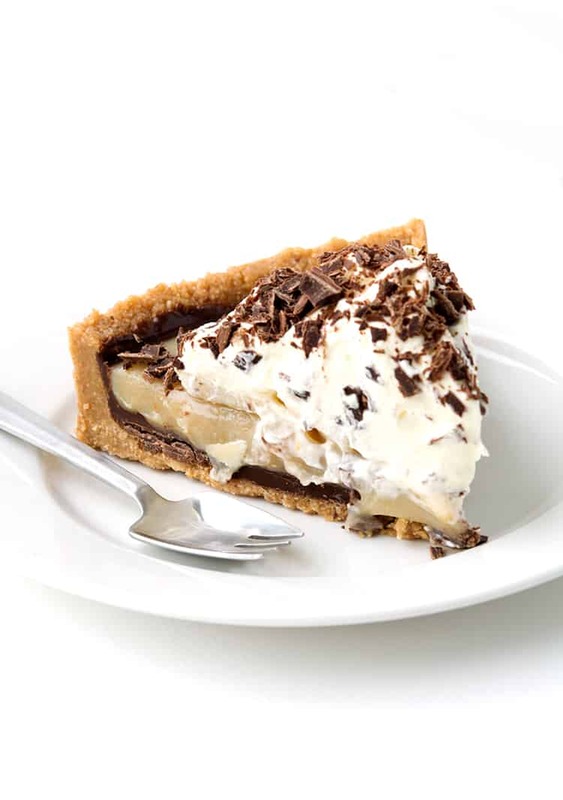 To serve, slice bananas and arrange over the top of the caramel, pile high the whipped cream, and sprinkle over chocolate shavings. You can use any plain sweet biscuit or cookie for the crust in this pie. Depending on the type of biscuit or cookie, you may need to add more or less butter. Gradually add the butter until the crushed cookies are wet and resemble sand. If they hold together when pressed in the tin, it’s perfect. If they are a little crumbly, add a tablespoon more butter. Wow! 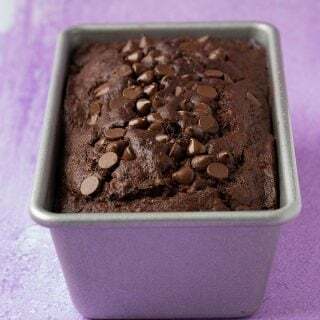 This was delicious and so easy to make – thank you for the recipe! Thanks for the lovely feedback Josh, so glad you enjoyed it! I tried making this yesterday. Word of advice (which everyone but me probably already knew) – you cannot stick the bananas between the chocolate and the caramel. It does not set nicely.. I wanted to bring it to the office so couldn’t do the bananas just before serving and thought that the bananas would turn brown if they were just on top. Luckily, I had also made my “never fail” carrot cake. And I’m enjoying the unset banoffee pie (in a bowl). The flavours are still great. Hi Julie, thanks for your comment. The pie does work best if you follow the steps and add the banana on top. Maybe next time you could try cooking the caramel for a minute or two longer to make sure it has thickened and the sugar has dissolved so it sets firmly in the fridge. Glad you enjoyed the delicious flavours! Oh, to be sure, the error was my fault. Not dinging your recipe. Just noting it in case any one else had the “bright” idea to modify it that way too. I did cook it for a while and the sugar was definitely dissolved – the parts around the edge with no banana were well set. 2) I cooled it a lot longer (I read another recipe that said putting the hot toffee layer on the bananas would “cook” them which would cause them to “leak”. So, still best with bananas on top, but if that doesn’t work (I was bringing to work and couldn’t do the bananas at the last minute), you can do the bananas underneath. Oh great feedback Julie! Thank you!! Okay, now I’m drooling. This pie looks INCREDIBLE- and so easy too!